The Monkey Jump is a large knight's move from the second to the first line. 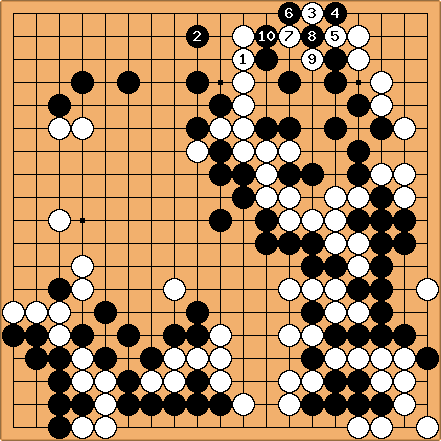 Similar to that is the Knight's move to a, which makes a Small Monkey Jump. It is normally a big endgame move: You use an open skirt to run under your opponent's group to reduce her potential territory. A monkey jump is proverbially worth 8 or 9 points in sente, although the exact amount depends on the position, and it may very well be gote. In cases where it is gote, it is often incorrect. Monkey jump ending in gote. Monkey jump ending in sente. Monkey jump ending in sente (follow up). Later, White will probably get this exchange in sente. But this is still a gain for Black. See Value of a monkey jump for a detailed discussion. If the marked stone is one line higher, as in this diagram, Black can keep sente with this simpler (and better) line, as White needs to defend the cutting point at a. Correct me if I'm wrong, but in this corner case (pun intended) the monkey jump is gote, correct? Even with the marked stone in the previous diagram gone, a play at a or b would still be gote because white will just atari. Is there a line of play for black that would still be sente in this case? Herman: Here, the Small Monkey Jump is more appropriate. GreenAsJade: is this only gote because of the marked stone (I just marked it now)? Without that stone there, it seems black does not have to worry about the atari after b because of the double atari response at c ? There is a mess after that, but it seems to turn into a big reduction of the corner, at the loss of one stone for black. The best response to the monkey jump depends heavily on the surrounding circumstances. See Monkey Jump/How To Stop, and Monkey Jump/Into High Position. Any of a, b, c, d, e may be right depending on whether White has stones on the circled points. a and b are often best if they can be played. One time I remember seeing something about using the monkey jump to connect two groups. I tried it in a game and I couldn't get it to work and now I can't find the page which talks about how to do it. Herman Hiddema: It usually only works if the stones on the second line that you are connecting are 3 points apart. So the move should be a monkey jump from the stone on one side, and a kosumi from the stone on the other side. It may work in other cases, eg if it is a one-point jump from another stone on the first line. See also: Monkey Jump Connection. First WikiMasterEdit by dnerra, 2003-12-01. Second WikiMasterEdit by Bill and andorian, 2007-7-28.